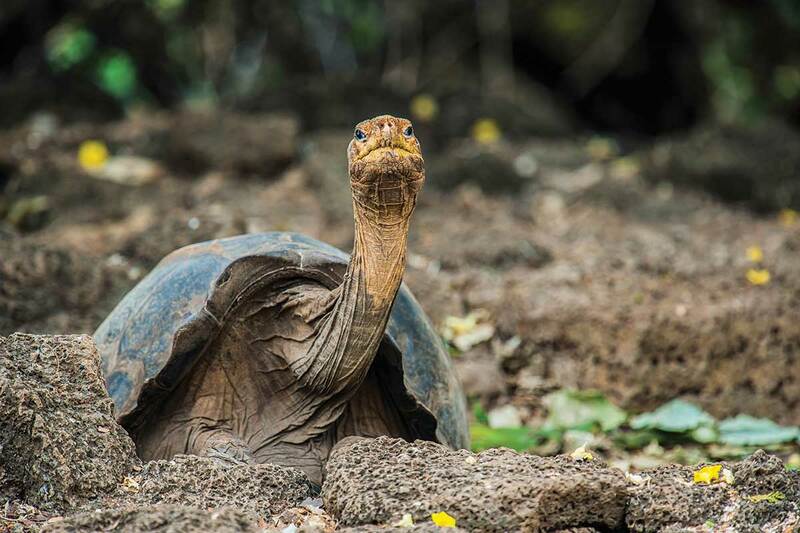 Experience the untouched wonder of the Galápagos, an adventure you’ll not soon forget. Since most of the archipelago is within a national park—and the surrounding waters are part of a marine sanctuary—the laws controlling mooring sites and island visits are extremely rigid. 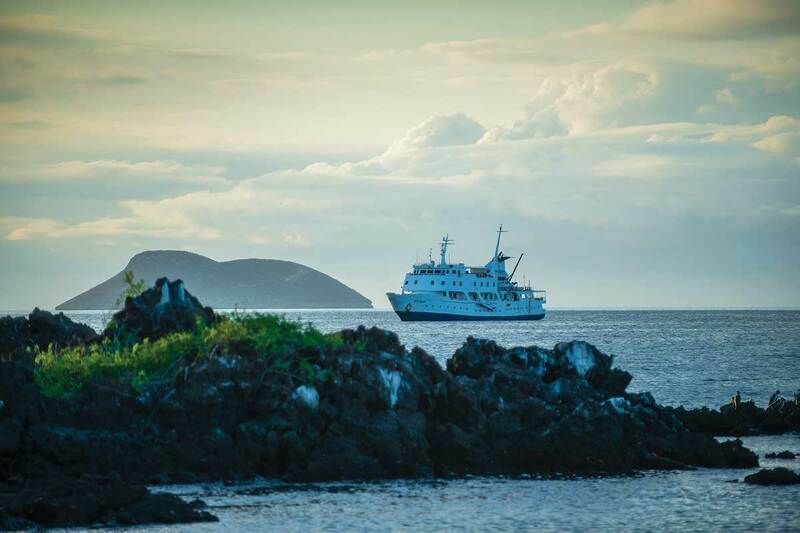 The best and easiest way to voyage through the Galápagos is not by private yacht but aboard one of the licensed expedition ships that offer voyages from a few days to a few weeks. It was, however, Charles Darwin who brought fame to the Galápagos. Although the naturalist voyaged through the islands in 1835 aboard the HMS Beagle—he only visited 4 of the 19 islands—it wasn’t until 1859 and the publication of his work On the Origin of Species that the islands became known to the outside world. But it would be another century before intrepid tourists ventured there when in 1969, the first cruise carrying just 58 passengers voyaged through the islands. Today, tourism generates a half-billion dollars per year, with nearly a quarter-million visitors exploring the islands annually. Most tourists fly first to Quito, Ecuador, and spend a night or two exploring this Andean capital. From there, flights hop to the port city of Guayaquil and then to Baltra International Airport in the Galápagos. From the airport it’s a quick transfer by taxi and boat over to Puerto Ayora on Santa Cruz Island, the hub of tourism. 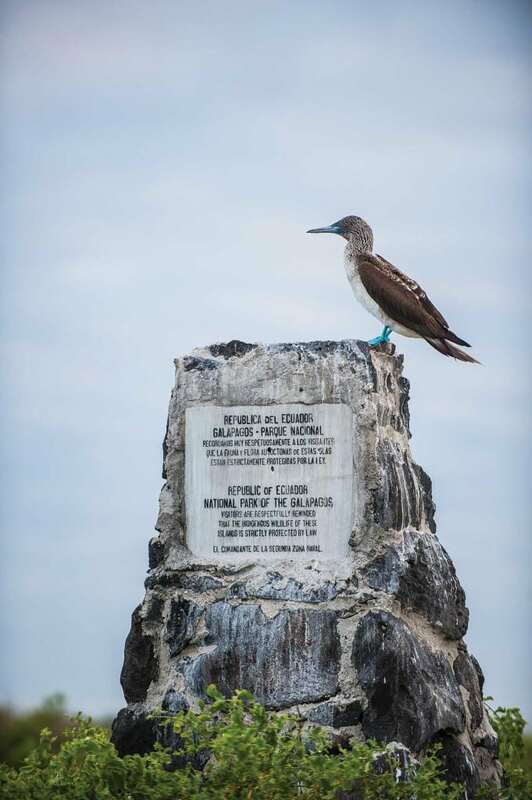 Abercrombie & Kent is one of the best cruising operators exploring the Galápagos. From Santa Cruz, their luxurious M/V Eclipse makes regular voyages among the islands. With only 24 cabins (all with sea views), this sleek 210-foot ship feels more like a private yacht; your shore parties are also smaller at 12 people per guide versus the standard 16. Most voyages start with a wet landing on nearby Las Bachas Beach, where you might get lucky and see some Caribbean flamingos in the lagoon or nesting green sea turtles on the beach (November to February). Bring a pair of water shoes or sturdy hiking sandals for the wet landings and dry, lightweight hiking boots for the island hikes. Another favorite stop is Puerto Egas on Santiago Island. Here, guides lead you on a hike along an old salt-mining road to the Fur Seal Grottos, beautiful tide pools and caves where penguins sleep and play. Ask to see “Darwin’s Toilet,” a cool lava tube that fills and empties with the swirling tides. Later that afternoon, the ship sails to Bartolomé Island for a hot, hour-long hike up the 300-plus stairs to the summit for beautiful views of Pinnacle Rock and Sullivan Bay. Afterward, take the ship’s zodiac out to the snorkeling grounds, where you’ll spot harmless whitetip reef sharks and Galápagos penguins. Bring bug spray to ward off the pesky horseflies on the beach. Rare land iguanas are the draw when the ship circles back to Santa Cruz Island to explore the cactus forests of Cerro Dragon (Dragon Hill). Wear a yellow shirt or hat. (Land iguanas feed on yellow cactus flowers and will scamper over to you for great photos.) 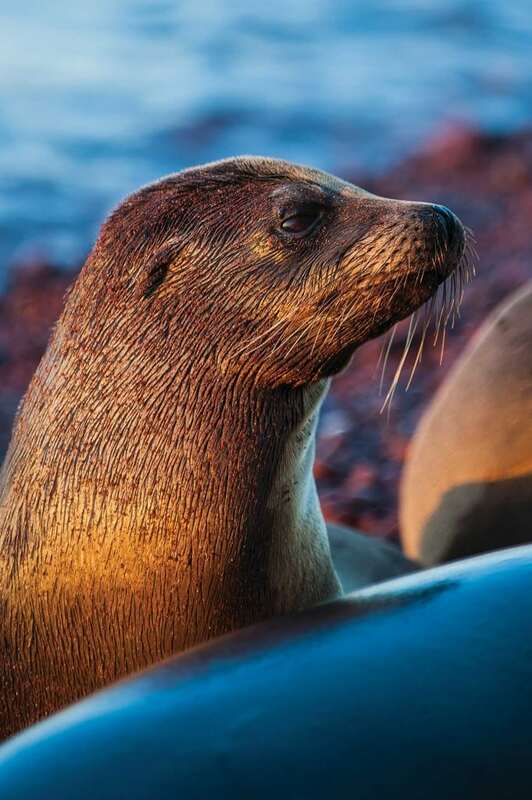 Then it’s off to the blood-red beaches of Rabida Island to photograph sea lions. Another favorite landing is at Tagus Cove on Isabela Island (Darwin was here), where you can hike through the palo-santo forests up the rugged slopes of a cinder cone to photograph the views and see some of the famous finches and mockingbirds. There’s also wonderful kayaking in the cove and a chance to snorkel with penguins again, or traverse a mangrove swamp by panga at Elizabeth Bay. Few tourist boats make it to Punta Espinoza on Fernandina Island, so count yourself lucky if your ship’s itinerary includes dropping anchor here at the only approved mooring spot at the island; you’re about to see a slice of “the real Galápagos.” A mere million years old, Fernandina is the newest and westernmost of the Galápagos Islands and also the most volcanically active. Its misty caldera rises more than a mile above the surrounding lowlands and erupts spectacularly about once every 10 years. 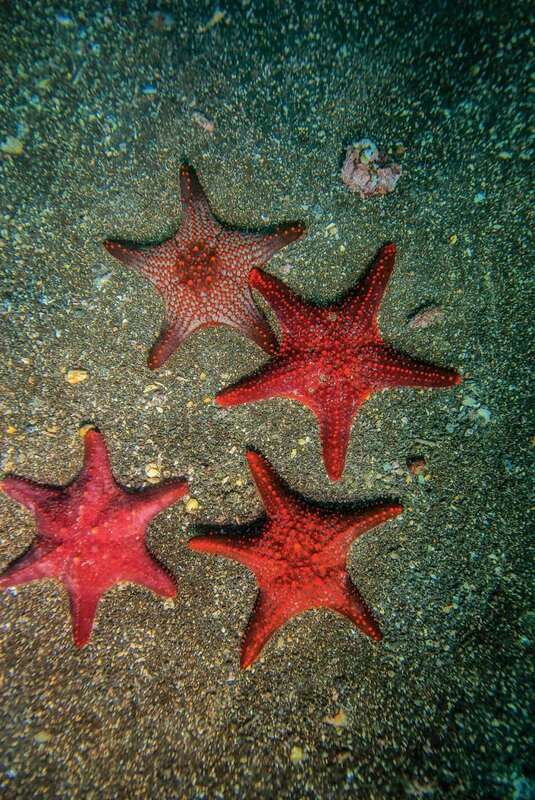 Fernandina is a glimpse of the Galápagos as they were long ago when life first found them. 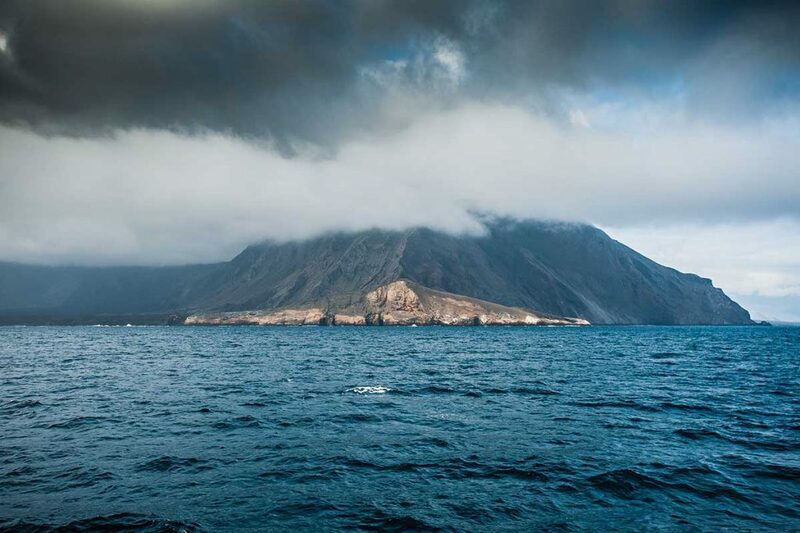 There are no introduced species on this remote volcanic island. Out on the shimmering black surface, only a scattering of lava cactus—a pioneer species—cling to the cracks and crevices. 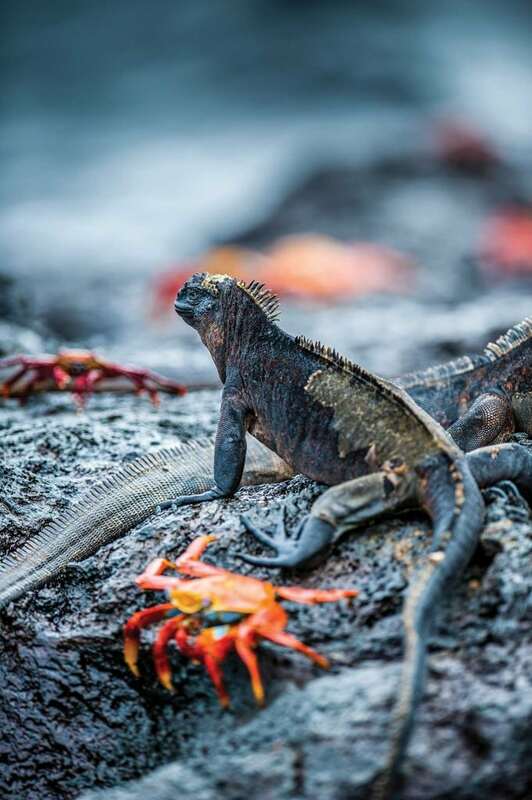 Red-throated lava lizards scamper across sometimes drawing the attention of the islands’ most dominant land predators, Galápagos hawks, often seen perched on palo santo trees. The lava field you’ll walk over is cabled and sinewy, frozen in long, ropy braids. It’s so sharp that it tears the soles off tennis shoes and can cheese-grate your knees if you trip, so wear boots and long pants for the hike. An afternoon sail to nearby Punta Vicente Roca on Isabela Island offers a fantastic few hours of snorkeling with inquisitive sea lion pups and sea turtles. Sea lions want to play, so don’t just sit there. Spin, blow bubbles, make noise under water, and don’t be surprised if they tug on your dive fins and mouth your snorkel. Gardner Bay on Española Island is one of the longest white-sand beaches in the Galápagos, and you’ll have complete freedom to explore it without a guide (but not into the desert beyond). Leave your boots but bring your hiking sandals, swimsuit, towel, and snorkel gear, and spend the morning swimming in this stunning bay with frisky sea lions. 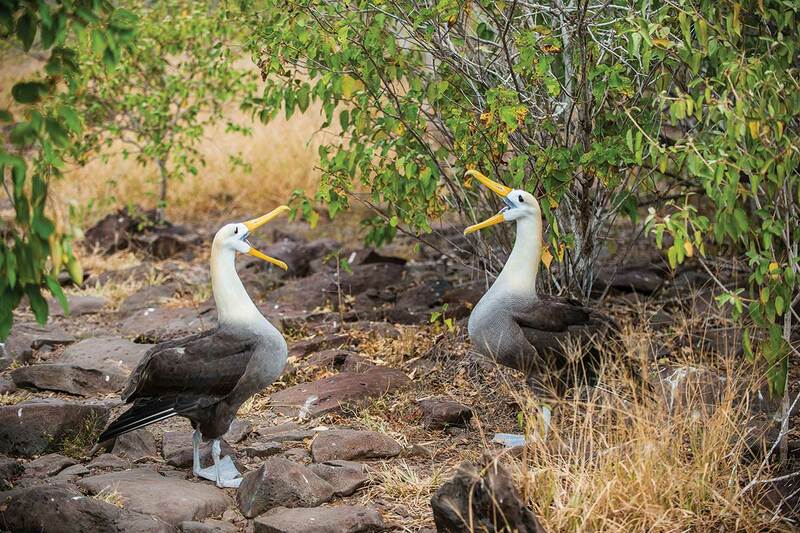 The next stop to nearby Punta Suárez includes hiking the 2.5-mile trail through colonies of blue-footed and Nazca boobies. Near the high sea cliffs, you should pass some of the 12,000 breeding pairs of waved albatross. From April to December the babies are learning to fly, an amazing and amusing sight. On your last night, you’ll pack your bags for an early departure, followed by one last zodiac ride through the mangrove swamps of Black Turtle Cove and a stop at the ship’s store for souvenirs. Choose something that brings to mind your epic adventure to this land that time forgot, but you surely will not.